Peptide CRPIYEFHGLYEEK, corresponding to amino acid residues 270-283 of human P2X1 receptor (Accession P51575). Extracellular loop. Homology Rat, mouse - 11/14 amino acid residues identical. 1,2. Anti-P2X1 Receptor (extracellular) Antibody (#APR-022), (1:200). 3,4. Anti-P2X1 Receptor (extracellular) Antibody, preincubated with the control peptide antigen. 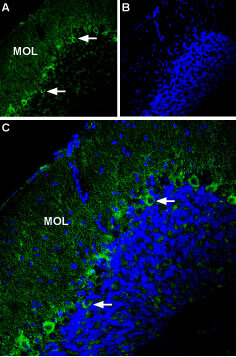 Immunohistochemical staining of mouse cerebellum using Anti-P2X1 Receptor (extracellular) Antibody (#APR-022). A. Most of P2RX1 labeling (green) appears in fine processes in the molecular layer (MOL) and in Purkinje cells (arrows show examples). B. DAPI is used as the counterstain (blue). C. Merge of A and B. ___ Cells + Anti-P2X1 Receptor (extracellular) Antibody (#APR-022), (10 µg antibody/1x106 cells). Cell surface detection of P2X1 Receptor in intact living human SH-SYS5 cells. A. Extracellular staining of cells with Anti-P2X1 Receptor (extracellular) Antibody (#APR-022), (1:50) followed by goat anti-rabbit-AlexaFluor-488 secondary antibody. B. Nuclear staining DAPI as the counterstain. C. Merged images of A and B. Seven mammalian P2X receptor subtypes (P2X1–P2X7) have been identified and cloned1-3. All P2X receptor subtypes share the same structure of intracellular N- and C-termini two membrane-spanning domains and a large extracellular loop. The various P2X receptor subtypes show distinct expression patterns. P2X1-6 have been found in the central and peripheral nervous systems, while the P2X7 receptor is predominantly found in cells of the immune system4. The P2X1 receptor is present in smooth muscle, cerebellum, dorsal horn spinal neurons, and platelets where it is suggested to play a regulatory role during in vivo homeostasis and thrombosis3,4,10,11. Anti-P2X1 Receptor (extracellular) Antibody (#APR-022) is a highly specific antibody directed against an epitope of the human protein. The antibody can be used in western blot, immunocytochemistry, immunohistochemistry, and indirect flow cytometry applications. It has been designed to recognize P2X1 receptor from rat, mouse, and human samples. Wright, A. et al. (2016) J. Immunol. 196, 4877. Anti-P2X1 Receptor Antibody (#APR-001). This antibody recognizes a different epitope and thus can also be used as a control for detecting P2X1. Anti-P2X1 Receptor (extracellular)-ATTO-488 Antibody (#APR-022-AG). A fluorescent primary antibody. It can be used in immuno-colocalization studies in conjunction with any of our antibodies raised in rabbit.